The conducting materials have free electrons which move from one atom to another when the potential difference is applied across them. This flow of electrons in a closed circuit is called current. On the basis of the direction of movement of electrons in a closed circuit, the electric current is mainly classified into two types, i.e., the alternating current and the direct current. Definition The direction of the current reverse periodically. The direction of the current remain same. Obtained From	 Alternators Generators, battery, solar cell, etc. Type of load	 Their load is resistive, inductive or capacitive. Their load is usually resistive in nature. Graphical Representation	 It is represented by irregular waves like triangular wave, square wave, square tooth wave, sine wave. It is represented by the straight line. Transmission	 Can be transmitted over long distance with some losses. It can be transmitted over very long distance with negligible losses. Application Factories, Industries and for the domestic purposes. Electroplating, Electrolysis, Electronic Equipment etc. The current which changes its directions periodically, such type of current is called alternating current. Their magnitude and polarity also change along with the time. In such types of current, the free electrons (electric charge) moved in the forward as well as in the backwards direction. The frequency (number of cycles completed in one second) of the alternating current is 50 to 60 Hz depends on the country. The alternating current is easily converted from the high value to low value and vice versa with the help of the transformer. Thus, it is mainly used for transmission and distribution. When the electric charge inside the conductor flows in one direction, then such type of current is called direct current. The magnitude of the direct current always remains constant and the frequency of the current is zero. It is used in cell phones, electric vehicles, welding, electronic equipment, etc. The graphical representation of the alternating current is shown in the figure below. 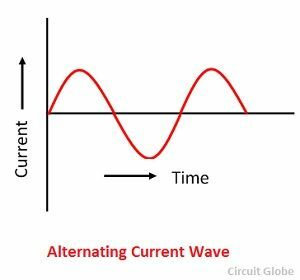 The current which changes its direction at a regular interval of time such type of current is called alternating current. Direct current is unidirectional or flows only in one direction. The charges in the alternating current flow either by rotating a coil in the magnetic field or by rotating a magnetic field within a stationary coil. In direct current, the charges flow by keeping the constant magnetism along the wire. The frequency of the alternating current is 50 to 60 hertz depends on the country standard, whereas the frequency of the direct current always remains zero. The power factor of the alternating current lies between zero to one, whereas the power factor of the direct current always remains one. The alternator current is generated by the alternator. The direct current is generated by the generator, battery and cells. The load of the alternating current is capacitive, inductive or resistive. The load of the direct current is always resistive in nature. The alternating current can be graphically represented through different irregular wave shape such as triangular wave, square wave, periodic wave, the saw-tooth wave, sine wave, etc. The direct current is graphically represented by the straight line. The alternating current transmits over a long distance with some losses, whereas the direct current transmits over very long distances with negligible losses. The alternating current is converted into direct current with the help of rectifier whereas the direct current is converted into alternating current with the help of the inverter. Few substations require for the generation and transmission of the alternating current. Extra substations require for the transmission of direct current. The alternating current is used in industries, factories, and for the household purposes. The direct current is mainly used in electronic equipment, flash lighting, hybrid vehicles, electroplating, electrolysis, for exciting the field winding of the rotor, etc. 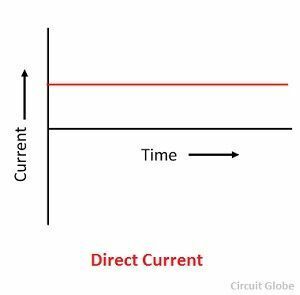 The direct current is more dangerous than the alternating current. In alternating current, the magnitude of the current becomes high and low at regular interval of time and in direct current, the magnitude remains the same. When the human body is getting shocked, the alternating current enter and exit from the body at regular time interval whereas the direct current, afflict the body continuously.